A looming ban on trans fats threatens the city’s beloved dessert. Trans fats, a man-made fat that improves the shelf life of a product by converting vegetable oils to solid fat, have long been a source of controversy in the packaged foods industry. Research has shown that they contribute significantly to heart disease, diabetes, and high cholesterol—more so than other, more natural sources of fat. The packaged food world relies on trans fats to maintain the stability of their products’ flavor and texture. But for large companies like Nestle and General Mills—who have been slowly transitioning their products away from trans fats—the ban, at this point, is just a small adjustment. For Berger Cookie producer Charlie DeBaufre, however, the ban is an existential crisis. The Berger Cookie is a simple concept: a thin, semi-sweet wafer with a roof of about half an inch of thick chocolate fudge. The genius lies in the proportions—each cookie is equivalent to scoring the corner slice of a cake, the slice where each bite comes with a double dose of frosting. The fudge is solid and rich and melts in your mouth, but remains grounded by the sturdy wafer. DeBaufre’s father worked for the bakery for a number of years, before deciding to purchase it when the previous owner, Charles Russell (who bought the bakery from the Berger family), retired. DeBaufre, a feisty individual with a booming voice, worked at the bakery as a kid, and has owned it since 1994. He’s fiercely loyal to his city: He wears a vintage Berger Cookies cap, sips his coffee out of a Baltimore Ravens mug, and regales me with stories about his neighborhood of Cherry Hill. When DeBaufre took over, he pushed the cookie to the forefront of the business, and Bergers became an overnight sensation when they were mentioned as part of a holiday gifting piece in the Baltimore Sun in 1995. That month, the DeBaufre family went from getting about 300 Berger Cookie orders during the holidays to about 10,000. Berger Cookies now make up about 89 percent of the business. The Berger Cookie has become a fixture of Baltimore culture—a point of pride for residents, and an essential item on lists of top city activities. 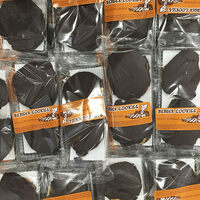 You’ll find Berger Cookies in hotel minibars, drug stores, and supermarkets, and for sale at Baltimore Orioles games. Couples have constructed entire wedding cakes out of Berger Cookies, and local ice cream shops sell Berger Cookie flavors. But here’s the rub: One of the most essential ingredients in the Berger Cookie is trans fats. Trans fats are what make the chocolate super creamy, prevent the fat and the water in the dough from separating (which would yield an overly crumbly cookie), and keep the cookie stable in both very warm and very cold settings. As the ban approaches, DeBaufre’s job has become devoted largely to testing trans fat-free margarines and fudge bases—made by various manufacturers putting out trans fat-free products to placate their packaged food customers—and trying to discover some alchemy that will recreate the iconic cookie. The day I visit the factory, DeBaufre is testing out two new options for margarine—one that is palm-oil based, and the other soy-based (he’s mostly settled on a new fudge base). The factory is an unassuming, no-frills operation. Butter and sugar beat quietly in the back, machines drop mini squirts of batter onto aluminum trays, and wafers bake in a rotating oven before cooling in red crates. Workers hand-dip the cooled wafers in big steel bowls of fudge, and the Bergers dry overnight. Eventually they’re packed into mahogany boxes branded with the old-timey Berger logo and an orange label. DeBaufre leads me to a rolling rack of cookies that has been set aside—the best of the trans fat-free experiments. I first taste the original Berger Cookie. It’s the topcoat that makes it—you can sink your teeth into the chocolate, which is luscious and deeply flavored, like the platonic ideal of an indulgent piece of fudge. The next cookie is the palm-oil one. In appearance, it’s indistinguishable from the original Berger. It has the same heft, the same matte coat of chocolate on top, the same “tails” (what DeBaufre calls the wayward bits of chocolate that stick off the end of the cookies). But the taste is slightly off: It has a top note of sugar, not of chocolate. It’s overly cloying. The wafer is a bit too firm. The second batch, with the soy-based margarine, fares better for me. I like that it’s not as sweet, more forward in chocolate flavor. The fudge tastes slightly more frosting-like than fudge-like, but the cookie, overall, has that undeniable craveability of the original. DeBaufre, a boisterous, tell-it-like-it-is sort of guy, is uncharacteristically apologetic as I taste the cookies—mentioning that certain ones haven’t had enough time to cool, or that the wafer may not be quite as pliable. He keeps giving me this look of equal optimism and despair. But when I tell him I like the soy-based cookie, a smile breaks across his face—like Willy Wonka in that infamous office scene at the end of Willy Wonka & the Chocolate Factory. He didn’t want to tell me prior to the taste test, but this is the closest he has come to a product that could live up to the legendary status of the Berger. “I don’t think customers will be disappointed—that’s how much I approve of this cookie,” he says, grinning. For DeBaufre, though, this high may be temporary. He knows that the food industry, in general, is shifting toward transparency and away from artificial ingredients. He’s already thinking about ways to replace the high fructose corn syrup in his cookies, as he’s certain that’s the next item the government will try to ban. Still, he’s committed to the Baltimore tradition, and he’ll keep churning out Berger Cookies until someone tells him he can’t anymore. This is the potential trade-off we face if we reform our food system in such a direction: a ban on sugary nostalgia, and childhood classics that just don’t taste the same, or disappear entirely. *Update 11/25/17: After our reporter visited the factory, Berger Cookie producer Charlie DeBaufre learned that his ingredients supplier switched to a fudge that contains no trans fats. The change in taste is so subtle that DeBaufre did not realize that his Berger cookies only contain trace amounts of trans fats—within the ban’s legal limit. What else are you going to do with all those yolks? A few Baltimore bakeries still serve this cheesecake named after 19th-century cottage cheese. The competition that shrinks shrimp cocktail to the size of your pinky and fits bento into a matchbox.